You can now read the final public report of the ORCID Scoping Project, a University of Oxford internal project funded by the Research Information Management and Technology Sub-Committee and led by the Bodleian Libraries. The report aims to summarise the current state of the ORCID environment in the UK and more widely, with reference to research carried out over the past four months, with a view to providing a series of recommendations for further investment in ORCID-related activities at Oxford. However, through working with other institutions and other ORCID stakeholders during the project it became apparent that the findings and conclusions in the report would be valuable to the wider ORCID community and it was therefore decided to release a version more widely. With thanks to colleagues in collaborating institutions, Jisc, ORCID and many other bodies (listed in the appendices), the report is attached. PLEASE NOTE THE CHANGE OF VENUE: WESTON LIBRARY LECTURE THEATRE. By exploring the cross-platform interoperability of new or relatively new digital projects in development, this talk will present a street view of theatre routes that London playgoers walked before and during the Shakespearean period. It will examine the physical environs experienced while ambling to the theatres inside and outside the city and also probe into another crucial walk, the stroll through the St Paul’s precinct. The nave of St Paul’s, then called Paul’s Walk, and the bookshops of Paul’s Cross churchyard instantiated, by a type of cultural accident, a general centre for hearing the news and, for readers, the gateway to remaining au courant. Walking and browsing in this area was something of a prerequisite for playgoers and, for playwrights, a locale where one could hear what was on the buzz and also a reservoir from which to cull material for successful plays. There have been a number of recent and fines studies connecting London city life with the early modern theatre. This talk will examine how digital initiatives may advance this field by offering more insights into theatre going and into how plays were fashioned for then current audiences by Shakespeare and other playwrights. Thomas Dabbs is a professor of English at Aoyama Gakuin University in Tokyo, where he has taught Shakespeare and the English Bible since 2003. Prior to this Dabbs taught at Hiroshima University. 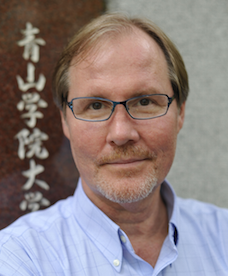 He is the author of Reforming Marlowe: the Nineteenth-Century Canonization of a Renaissance Dramatist and Genesis in Japan: The Bible beyond Christianity. His recent research and publication focuses on the St Paul’s cathedral precinct in early modern London and the impact of this area on Shakespearean drama. He is a native of the state of South Carolina in the USA.